Soon Microsoft will allow users to pause updates in Windows 10. Since the release of Windows 10, some users hate the way Windows get updates and want more controls over it. Previously, Windows 10’s Anniversary Update broke webcams and previously released cumulative update also broke the internet connection for many users. Recently, Windows 10 internal build 14997 leaked which includes a new “Pause Updates” option. As the name implies, this option can pause the updates for up to 35 days. It will be useful for those users who wants to install a stable update on their systems. However, the leaked build 14997 is a Windows 10 Enterprise build, so it’s yet to confirm whether this feature will come to Windows 10 Home and Pro users. 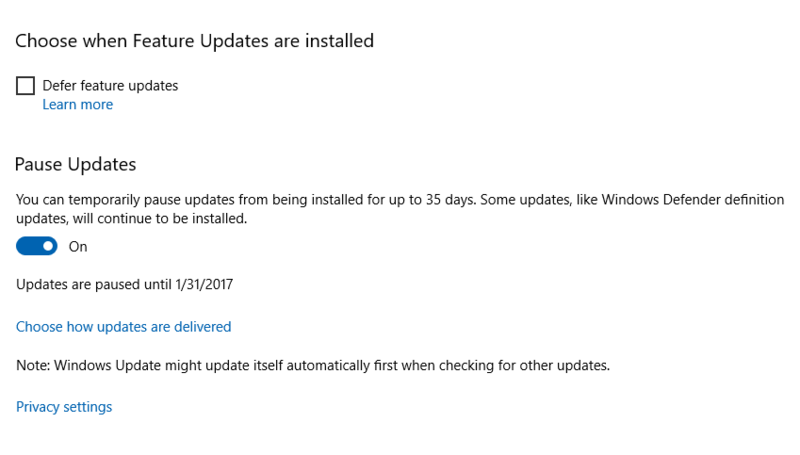 Meanwhile, Microsoft confirms that security updates for Windows Defender will continue to be installed automatically. Finally, Windows 10 “Pause Updates” feature will be available with upcoming Creators Update. Windows 10 Creators Update will arrive in March or April 2017. Windows Insiders will soon be able to test this feature in upcoming Insider builds in January 2017.